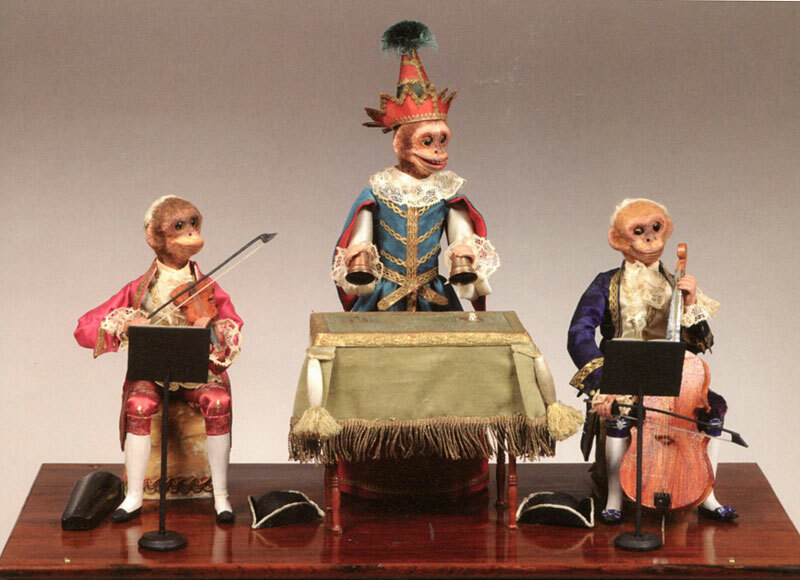 Call for Works for Congress of Curious Peoples Curiosity Vendors! 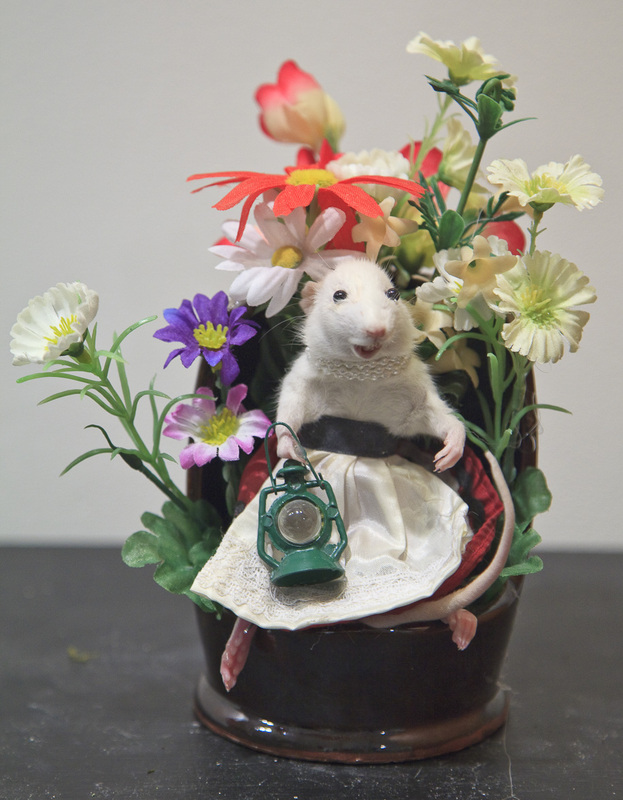 Coney Island USA's Congress of Curious Peoples has a few vendor spots left! 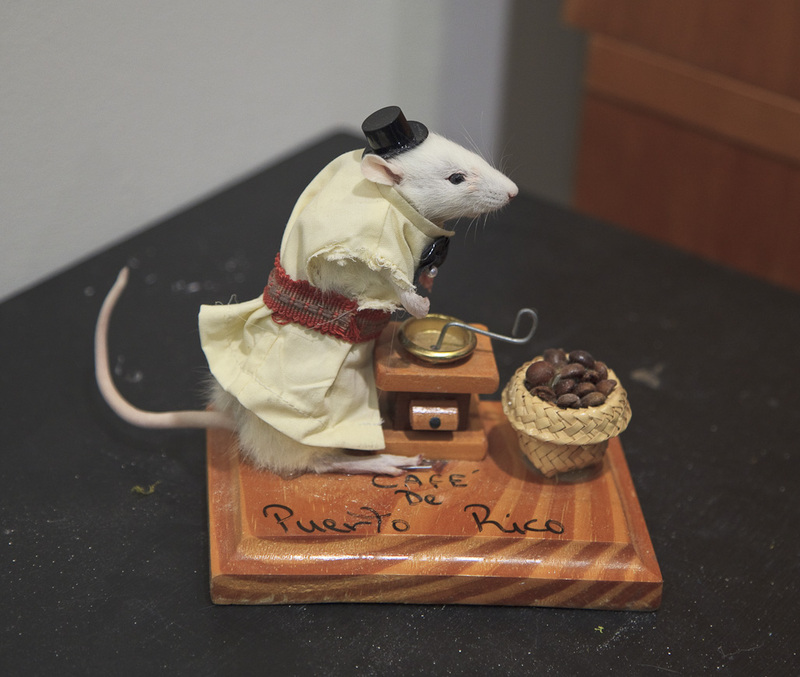 The Congress of Curious Peoples is Coney Island USA's annual celebration of Oddity and Oddities. It begins with the Sideshow Hall of Fame induction event and continues with a 10-day series of performances and lectures on Curiosity and Curiosities, featuring notable faces from the sideshow world and talks by international scholars. The final weekend of the Congress includes a 2-day symposium and performances by some of Coney Island's most important sideshow stars. Now in its 6th year, the Congress is meant to build a community of scholars, practitioners, vendors, and enthusiasts; centered around a field with its home in Coney Island. 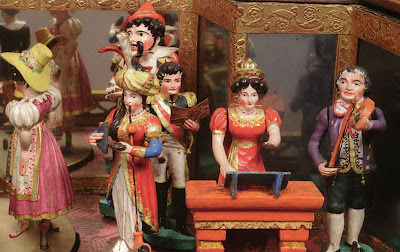 It is quickly expanding to become an important gathering of people who are interested in the past, present, and future of sideshows, dime museums, cabinets of curiosity, 19th and 20th century spectacular culture, and the obscure American performing arts that Coney Island USA is dedicated to preserving. We expect between 500 and 1,000 individuals to pass through our doors in the course of events, and they are all committed aficionados of all things curious. So if you're an artist who's work reflects the curious, the strange, the macabre, the bizarre and the wondrous and wishlike to be considered as a vendor, please contact congressvendors@gmail.com. More on the event itself can be found here. Hope to see you there. Panoramas! Baroque TV Evangelism! Human Zoos! 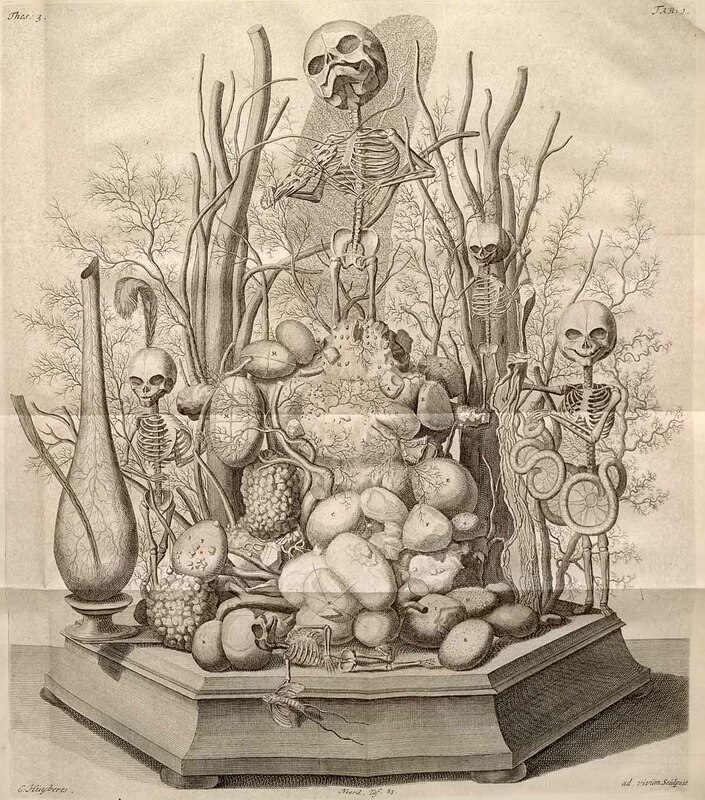 Frederik Ruysch! Religious Theatre! 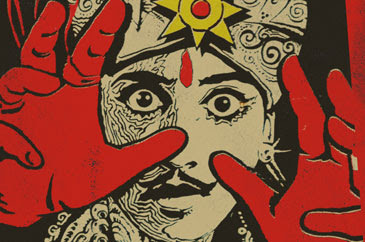 Announcing the 2012 Congress of Curious Peoples Lineup! I am SO very excited to (finally!) 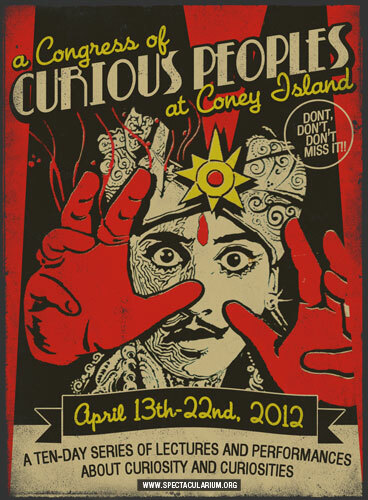 announce the lineup for this years' Congress of and for Curious Peoples, taking place this April 13-22 at Coney Island USA! For those of you new to the concept, The Congress of Curious Peoples is a 10-day series of lectures and performances devoted to curiosity and curiosities broadly considered. If features sideshow acts, lectures, performances, and a 2-day scholarly-yet-popular symposium called The Congress for Curious Peoples, which is produced by The Morbid Anatomy Library in tandem with The Coney Island Museum. This year's Congress for Curious Peoples symposium will feature panel discussions on such topics as pre-cinematic immersive amusements and religion as spectacle, while some of the featured speakers will be Sara Velas of The Velaslavasay Panorama; Paul Koudounaris of Empire of Death; an as-of-yet unnamed representative of the amazing Sleep No More; and Colin Dickey, author of Cranioklepty. Also featured will be stand-alone lectures on the 17th century artist of fetal skeleton tableaux Frederik Ruysch and the phenomenon of ethnographic displays called "human zoos," a screening of an over-the-top early 1970s TV Evangelist Christmas spectacular, and introductory lectures by myself and Coney Island Museum director Aaron Beebe. Full lineup below; hope to see you at some--if not more--of the terrific events making up this year's Congress! Tickets for the symposium are available here; for tickets to individual events and lectures, click here; 10-day Congressional Passes--which provide access to all events!--are available here. All events take place at 1208 Surf Avenue in Coney Island in Brooklyn, New York; you can map it here. See you there!!! 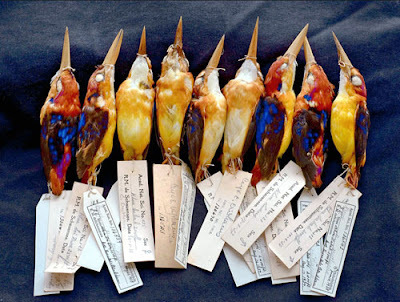 The Philadelphia Academy of Natural Sciences Celebrates its Illustrious and Incredible Collection and History in Two New Exhibitions and a Book! In the 17th, 18th and early 19th centuries, when natural history was still called philosophy and most naturalists were amateurs, collectors would create what they called cabinets of curiosities — accumulations of animal, vegetable, mineral and anthropological specimens to amaze and amuse. 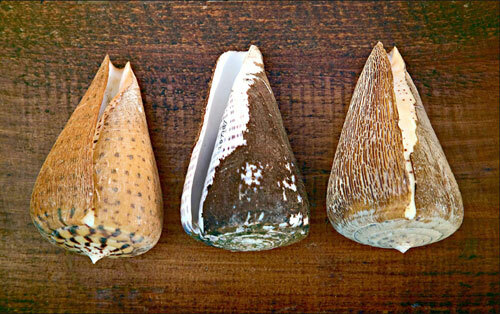 Often these collections grew large enough to occupy entire rooms, or even buildings. In some cases, they turned out to be precursors of modern museums. The Philadelphia Academy of Natural Sciences has a lot going for it. It is the oldest natural science research institution and natural history museum in the New World, with a history stretching back to 1812. 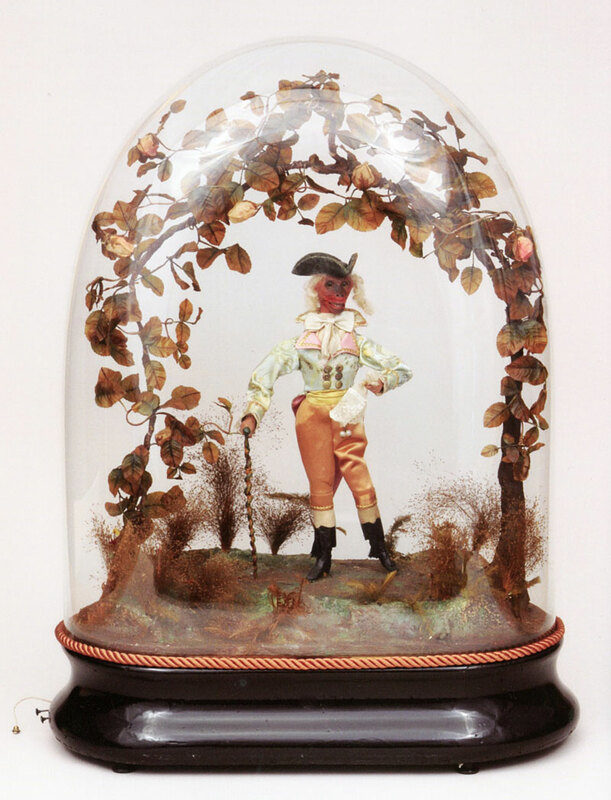 It boasts the Titian R. Peale Butterfly and Moth Collection, a lot of nearly 100 glass boxes containing said insects arranged in pleasingly geometric patterns by Titian Peale, son of painter and first American museologist Charles Willson Peale (see 4th image down). It boasts fossils collected by American president and Declaration of Independence author Thomas Jefferson. It also houses an incredibly vast and utterly astounding collection of natural history artifacts, books, taxidermy, skeletons, wet specimens and more. More's the pity, then, that you would never suspect the quality and breadth of this collection by its public face, which gives one the impression that The Academy is merely a bland, second-rate natural history museum aimed at easily distractable children. I am very pleased to report, then, that the Philadelphia Academy of Natural Sciences has used the pretext of its 200th birthday to right this wrong, and make visible its illustrious history and mind-bogglingly gorgeous collection through 2 new exhibitions--both now on view--and a new nearly 500-page luxurious book. One exhibition--"The Academy at 200: The Nature of Discovery"--displays rarely viewed specimens and artifacts from the museum stores. "Everything Under the Sun," a second exhibition, features luminous photographs by the amazing Rosamond Purcell of a variety of the incredible artifacts and specimens hidden backstage. 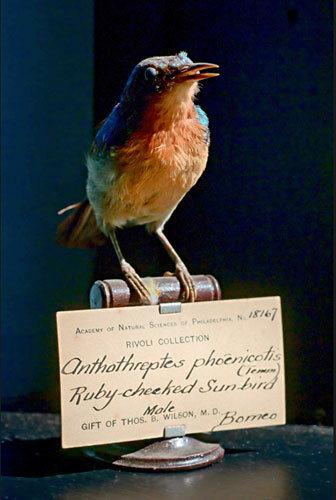 The associated book is entitled A Glorious Enterprise: The Academy of Natural Sciences of Philadelphia and the Making of American Science and features Rosamond Purcell's lavish color photographs. Above is an excerpt from The New York Times' review of the book and exhibitions; you can read the entire piece and see the photographic sideshow (from which the above images are drawn) by clicking here and here, respectively. You can find out more about the book “A Glorious Enterprise"--and purchase a copy of your very own--by clicking here. You can find out more about the exhibitions by clicking here and here. 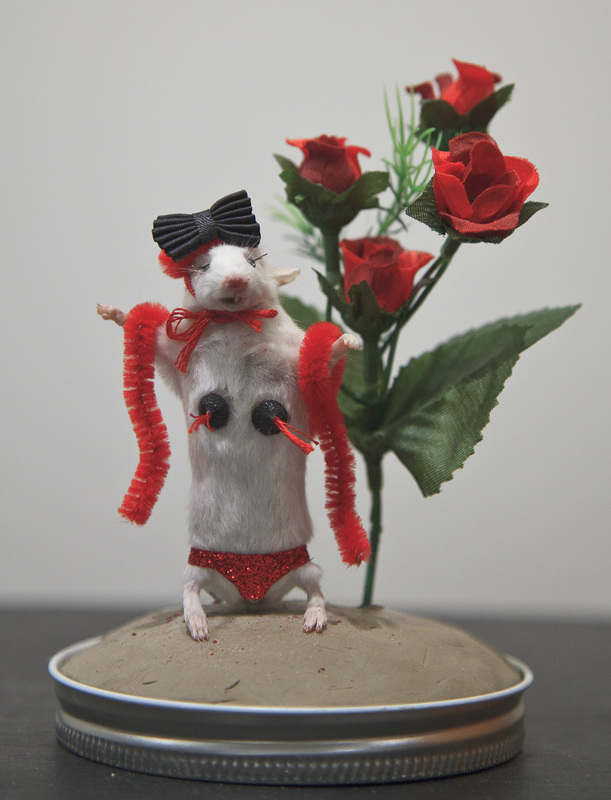 Thanks so much to friend and Morbid Anatomy Art Academy Instructor Marie Dauhiemer for sending this along! 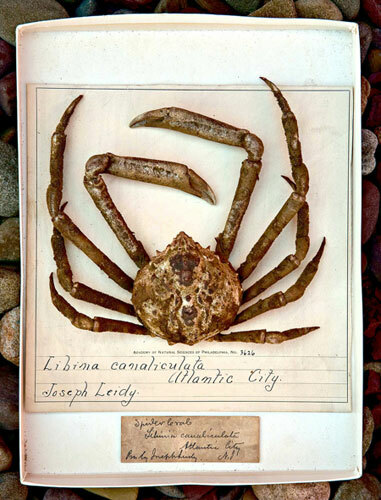 A spider crab (Libina canaliculata), collected by Joseph Leidy in Atlantic City. Black-backed kingfishers (Ceyx erithancus), collected by the ornithologist Rodolphe Meyer de Schauensee in Siam (now Thailand), 1937-38. Cone shells collected for the museum from Tanzania, Dutch New Guinea and the Palau Islands by A.J. Ostheimer III during the 1950s. 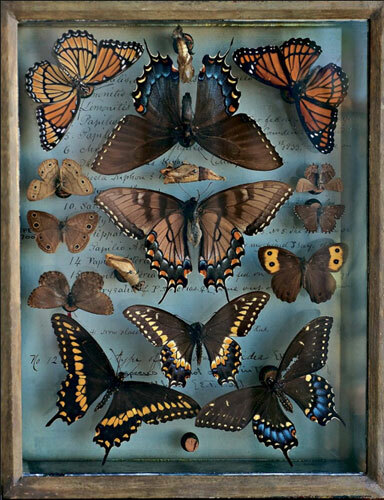 A selection from the butterfly and moth collection of Titian R. Peale, a noted 19th century entomologist. A Ruby-cheeked Sunbird from Borneo, given to the Academy by Thomas B. Wilson in 1846. Very much hope to see you at this newly announced class, the latest addition to the Morbid Anatomy Art Academy series I am organizing at Observatory! 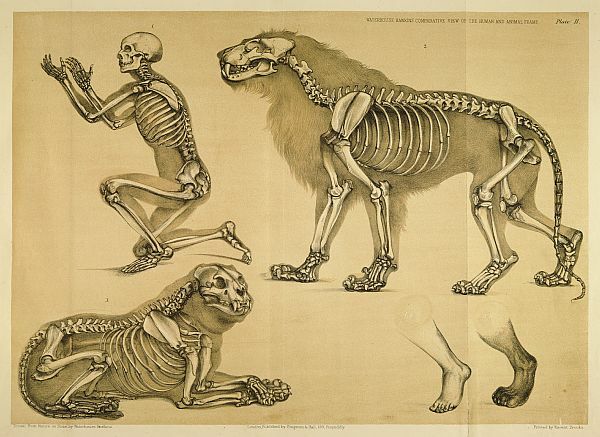 Saturday’s class will be held at Observatory, where with the aid of several skeletons we’ll look at basic structures, sprinkling our exploration with odd facts and observations. Messy investigatory drawings will ensue. Sunday’s class will be a field trip to the American Museum of Natural History, where applying the principles of Saturday’s class we’ll create beautiful drawings of the animals on display. Then, mastery attained, we will stride forth into the world, better artists and better people. 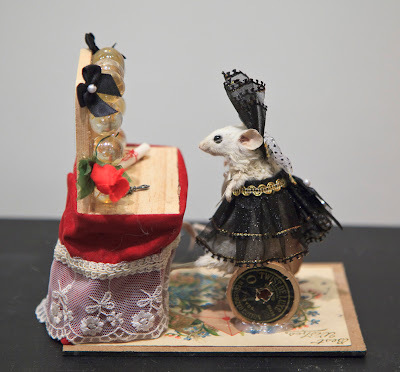 You can find out more here; you can RSVP by emailing me at morbidanatomy [at] gmail.com. You can find out more about the Morbid Anatomy Art Academy by clicking here. 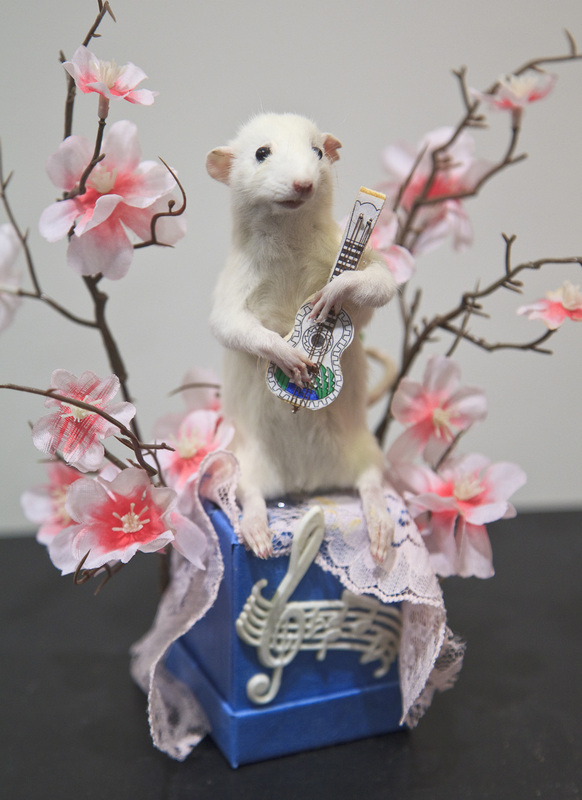 Above are some photos from the recent Valentine's Day edition of our most popular and most often sold out of Observatory class, Anthropomorphic Mouse Taxidermy Class with Susan Jeiven. Sue was recently profiled by the Spanish Television network Telemundo in a piece entitled "Pasatiempos controversial: Disecan animales muertos para decorar;" you can view it in its entirety by clicking here. 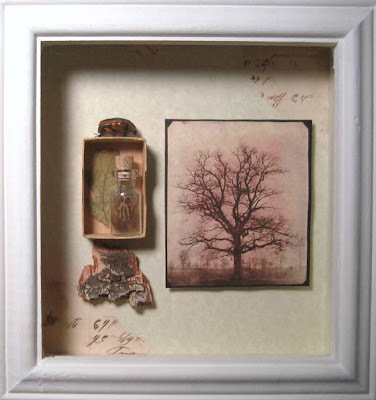 For those interested in studying with Sue, in making your own pieces and learning this largely lost Victorian art: I am pleased to announce a few rare vacancies in some upcoming classes; click here to find out more. Click on images to see larger versions; you can also see more photos from past classes by clicking here. 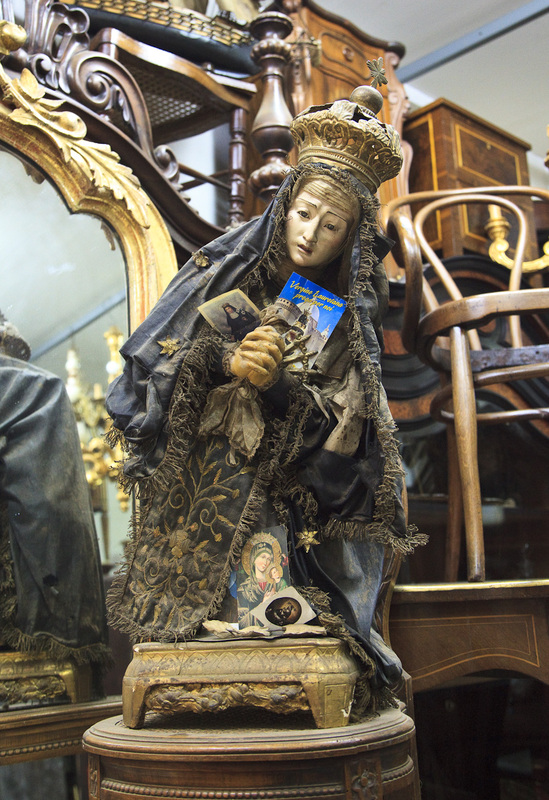 More from Italy, as I sort through my thousands of photographs: I don't know much about the top piece, but I am guessing it is a 18th or early 19th century Madonna Dolorosa, Mater Dolorosa, or Lady of Sorrows, a popular motif in Naples; we spotted it at one of the many antiques shops we popped into on our trip. 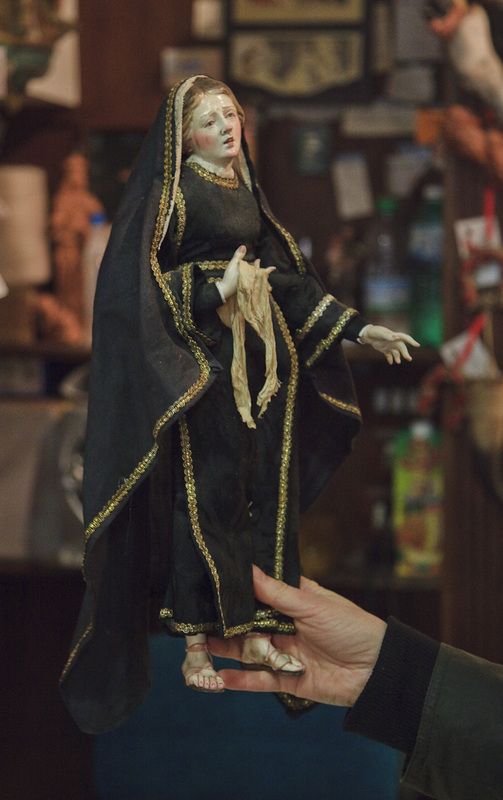 The bottom image is my own Madonna Dolorosa, made by the workshop of Giuseppe and Marco Ferrigno, a studio which continues to create--by hand!--fine Baroque-style crèches and terracotta figures of the sort for which Naples is still, rightrully, renowned. Click on images to see much larger, finer images. Coney Island USA's Amazing Annual Spring Gala! This Saturday, March 24; Special Prizes for Morbid Anatomy Readers! I am very excited to draw your attention this year's annual Coney Island USA Spring Gala, fast approaching and taking place this Saturday, March 24th! Last year's iteration was amazing; these folks really really know how to put on a party. The $100 ticket gets you not only an evening of performance, music, burlesque and spectacle, but also free booze from 7-11, hors d'oeuvres and exclusive access to the VIP balcony where you and hide from the throngs if so desired; you are also supporting the wonderful cause that is Coney Island USA. I will definitely be there; hope to see you there, too! Also, please note: as a special incentive, if you type "Morbid Anatomy" in the notes field on the ticket site, you will recieve a free Morbid Anatomy totebag from your friends here at the blog! CONEY ISLAND USA SPRING GALA 2012: CELEBRATING THE 30TH ANNIVERSARY OF THE MERMAID PARADE! 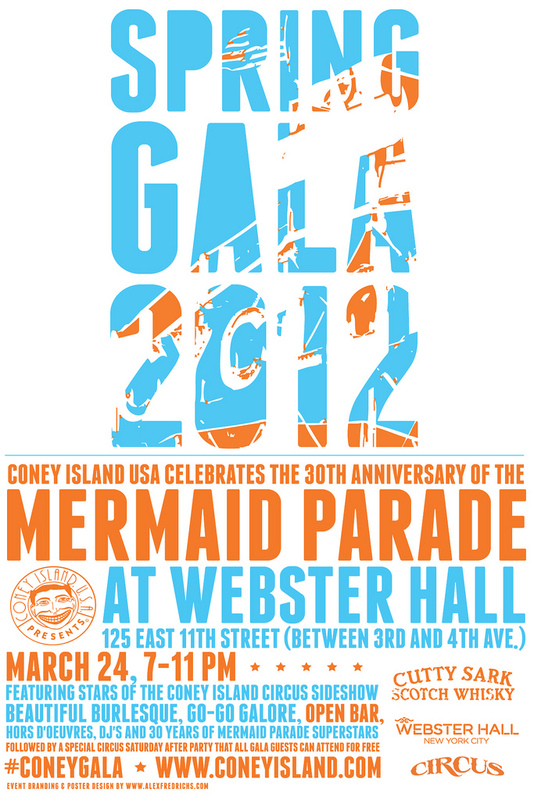 Join Coney Island USA as we invade Manhattan at New York’s oldest nightclub, Webster Hall, and celebrate the 30th Anniversary of the Mermaid Parade at our annual Spring Gala. All proceeds of the Spring Gala go directly towards funding Coney Island USA's innovative arts programming such as The Coney Island Circus Sideshow, The Mermaid Parade, The Coney Island Museum, Burlesque at the Beach and the Coney Island Film Festival to name just a few. Coney Island USA also fights to preserve and revitalize Coney Island’s historic amusement district. This year’s gala event will feature a dazzling display of daring feats executed by the cast of Sideshows by the Seashore, some of New York’s most talented and titillating burlesque performers, a glorious gamut of go go gals and guys, as well as special musical guests for your auditory pleasure. And be on the lookout for all kinds of surprises! The Voice of The Mermaid Parade: Chris T.
Also expect Special Guests from over 30 Years of Mermaid Parades, including former Royalty - Joe Franklin, Phoebe Legere, Alison Gordy, Fred Kahl, *World Famous Bob*, Kiva, Ron Kuby, Reverend Billy, Savitri D.
AND (IF THAT ISN’T ENOUGH!) ALL OF OUR GUESTS WILL BE INVITED TO STAY AT WEBSTER HALL FOR A VERY SPECIAL CIRCUS AFTER-PARTY BEGINNING AT 11PM! Check out photos from prior galas here. ALL advance online ticket buyers will be entered into a drawing for TWO seats on the judges stand for this years 30th Anniversary Mermaid Parade on June 23rd (a $300 dollar value), to be given away at the Spring Gala. So get your tickets online now, and you could be our lucky winner. Advance online sale ends Friday, March 23rd at 11pm. Spring Gala Supporter, $100 (includes special signature cocktails, beer and wine from 7-11, hors d'oeuvres and exclusive access to the VIP balcony where you can interact with past Royalty, Celebrities and Coney Island USA’s core supporters), Click here to order. General Admission (Entry Only) Tickets, $60, Click here to order. Advance sale ends Friday, March 23rd at 11pm. Tickets may be purchased at Webster Hall night of the gala (March 24th). Please Note: There are no restrooms on the main level and no elevator access to the restrooms, however, venue staff is prepared to carry any wheelchairs or assist in getting patrons into the venue and to the restrooms, if necesssary. You must let us know if you have special needs. How else can I help support Coney Island USA? Join the Host Committee! Co-Chaired by Darren Aronofsky! Joining the Host Committee is a great way to get involved and help make this amazing event happen. Host Committee members sell or purchase 5 Gala Supporter Tickets or 3 V.I.P. Tickets and receive a free admission for themselves so they can host their friends in return! Committee members are invited to a private dinner in recognition of their support and will have their names printed in the Gala Journal that will go to all of our guests. 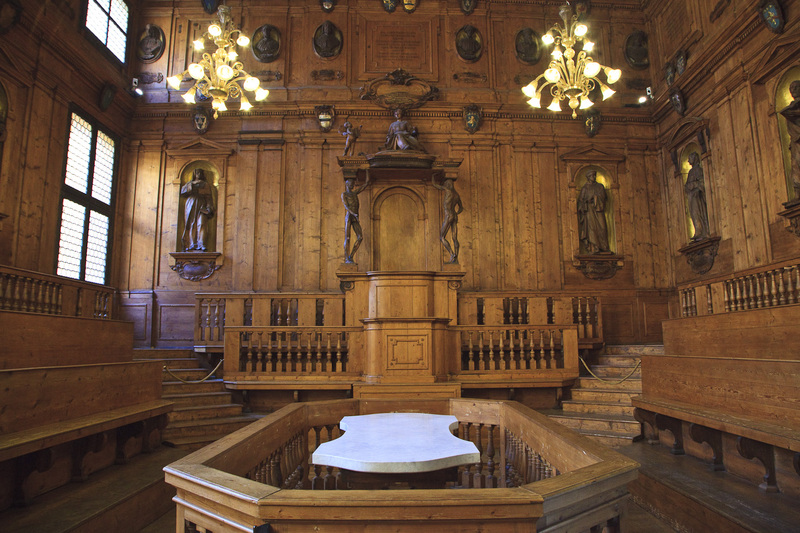 Although their academic paradigms may at first seem diametrically opposed, the association between arts and sciences has survived renaissances, revolutions and beyond. This intellectual conjunction has motivated artistic practice and production throughout history, forming the conceptual nucleus of some of the most stimulating forms of creative expression. By engaging with this inter-relationship, we hope to address the assumed divisions that have kept the arts and sciences as separate areas of academic enquiry, whilst at the same time questioning if such an alliance is necessary or profitable for either discipline. Papers should be 20 minutes in length and abstracts of no more than 300 words should be submitted with a brief biography to: aah.art.science@gmail.com by 29 April 2012. The conference is open to all, but speakers need to be student AAH members. Image from call for papers PDF; Rebecca Nichols, Arbor Vitae (2007), more here. A verger's dream: Saints Cosmas and Damian performing a miraculous cure by transplantation of a leg. Oil painting attributed to the Master of Los Balbases, ca. 1495. Size: wood ca. 169 x 133 cm. 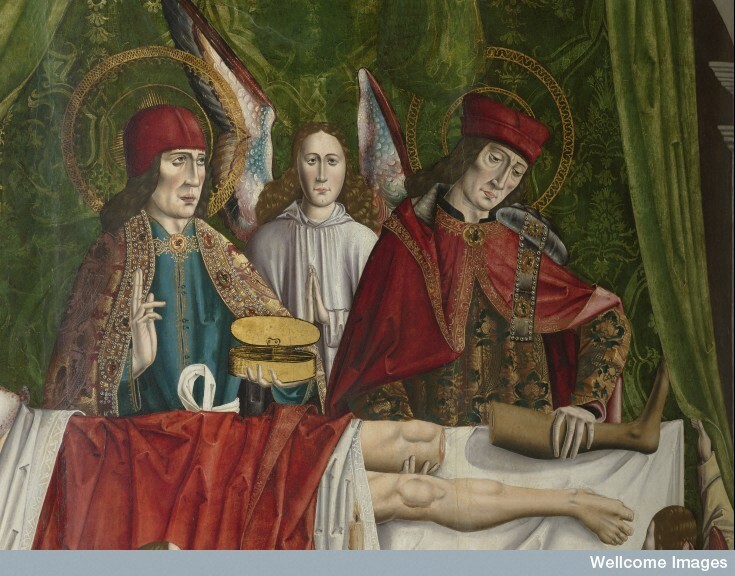 From the incredible Wellcome Image Collection, via today's Wellcome Images news bulletin. Click on image to see larger, more detailed version. This wonderful looking event just in from friend, former Observatory lecturer, and author of the lovely Portraits of the Mind: Visualizing the Brain from Antiquity to the 21st Century Carl Schoonover; hope very much to see you there! Two leading neuroscientists debate maps, minds and the future of their field. Time: 6:30 pm, cocktails. 7 pm, program. What will be the next big breakthrough in neuroscience? What will finally explain how brains work, how they fail in disease, and what makes us each unique? Some neuroscientists believe that research would be radically accelerated by finding and deciphering “connectomes,” maps of connections between neurons. Funding agencies are wagering millions of dollars on the idea that connectomics will be as fundamental to neuroscience as genomics is to molecular biology. But others disagree, arguing that maps of the brain by themselves cannot offer much insight into how this remarkable organ does its job. Just as a genome by itself is only a blueprint with little power to explain how an organism works, a connectome is at best a framework with little power to explain brain function. Should neuroscience make it a priority to launch a significant connectomics program, diverting human and financial resources from other worthy goals? Join us as leading “connectomist” Dr. Sebastian Seung defends his position in public against the formidable neurophysiologist Dr. Anthony Movshon. Award-winning science writer Carl Zimmer teams up with co-creator of NPR's Radiolab, Robert Krulwich, to moderate this debate on neural cartography, guiding the audience through both known and unknown territory as we ask the question: Are brain maps the future of neuroscience or an empty promise? Seating is limited. Tickets can be reserved beginning March 12 at Noon. NeuWrite is a collaborative working group for scientists and writers. Image credit: A. Zlateski based on images of K. Briggman, M. Helmstaedter, and W. Denk. 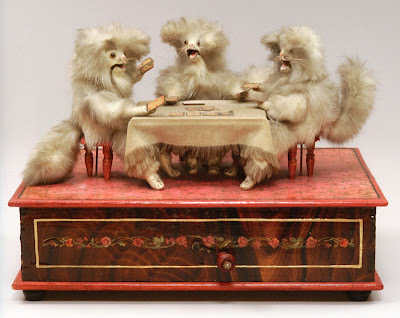 The Murtogh D. Guinness Collection at the Morris Museum is an astounding collection of automata (mechanical toys popular in the 18th and 19th century) and mechanical musical instruments that can be visited in--of all surprising places--Morristown, New Jersey. 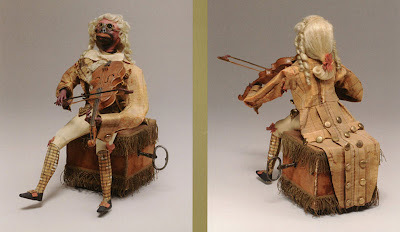 The collection is mind-blowingly vast; it is, in fact, the largest such public collection in the U. S. and one of the largest in the world, with around 700 automata and mechanical musical instruments and over 5,000 programmed media, nearly all of which are were produced in the 19th Century. The highlight of the Morris Collection--in my opinion, at least!--is its extensive lot of fine 19th Century European automatons. Most of the pieces are in excellent repair and still able to go through their uncanny motions, and the scale, quality, and range of the collection are simply flabbergasting, the kind of thing you might consider yourself lucky to find in France (where many automata producers were based) but certainly not here on the East Coast of the United States. The Morris Museum has just published a new book devoted to this collection, and I currently have 10 copies of the book in stock. 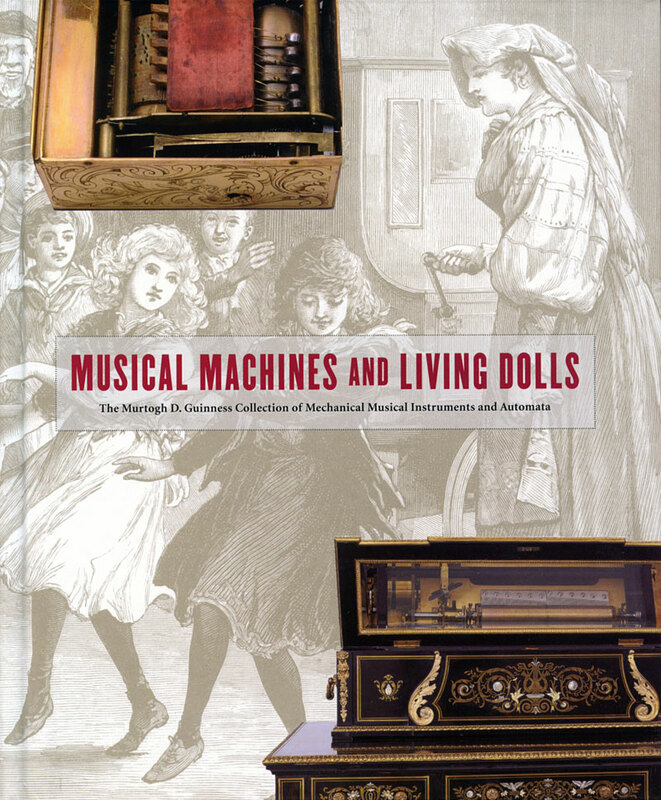 Entitled Musical Machines and Living Dolls: Mechanical Musical Instruments and Automata from the Murtogh D. Guinness Collection, this book is a lovely little gem all its own; it is hardcover, full color throughout, beautifully printed, and well-researched. It also includes a well-researched overview of the history of automata from ancient times to the present and a biography of Murtogh D. Guinness, the heir to the Guinness beer fortune who amassed this collection and ultimately bequeathed it to the Morris Museum. The book also--luckily for me!--features extensive text and scores of images (all images above are drawn from the book!) devoted to many of my favorite pieces in the collection, such as a number of 18th Century-style monkey dandies engaging in human activities (images 2, 3 & 4), 3 cats playing cards (image 5), a lute-playing Mephistopholes (image 7), an asp-suiciding Cleopatra (!!!) 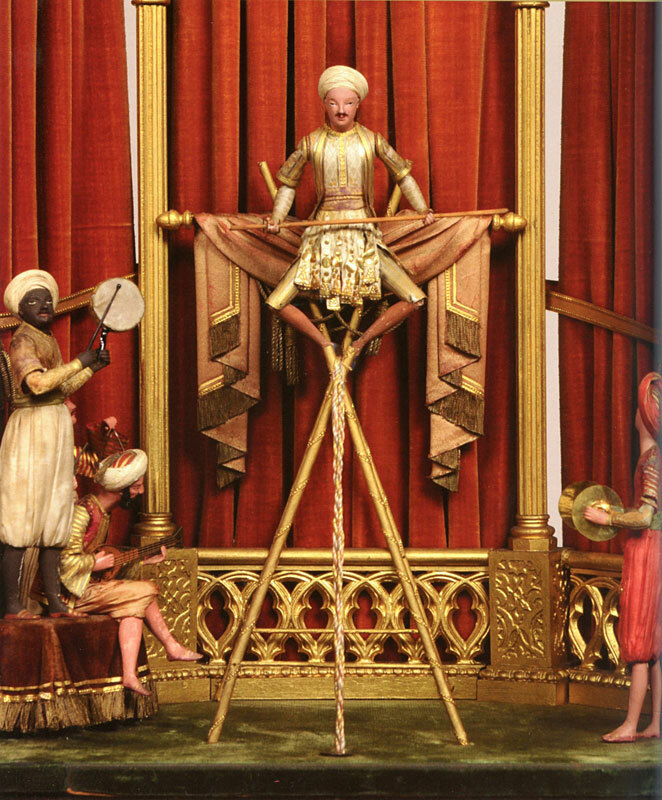 (image 6), performing tightrope walkers with orchestral accompaniment (image 9), a hookah-smoking Turk, singing birds, strutting peacocks, performing magicians, street vendors peddling their wares, and much, much more. Surrounded by a massive gilt frame, this animated scene would have dominated most parlors of the time. 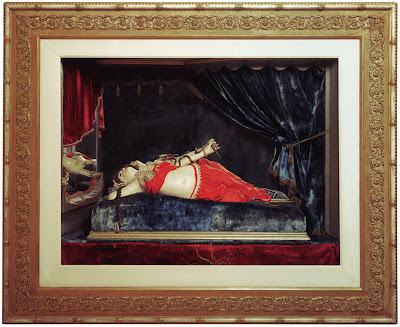 It depicts a highly sensual version of Queen Cleopatra of Egypt's supposed suicide in 30 B.C. When activated, her breast heaves, her eyelids blink--and an asp strikes. Although made in the late 1800s, the scene reflects a long-standing Western fascination with Egypt, which had been renewed by Napoleon Bonaparte's occupation of the country at the turn of the nineteenth century. Along with tens of thousands of troops, Bonaparte brought with him scientists and scholars who recorded all that they saw. The Description de l'Egypte, which emerged from their research, became a source for artists, designers, architects, and others, and the ensuing widespread fascination spread from everything from furniture to parlor entertainment. Morbid Anatomy is delighted to be assisting The Morris Museum in the distribution of this lovely and informative book, which contains images and information to be found nowhere else. The cost of the book is $40; shipping and handling within the United States is $5 and shipping and handling for international orders is $20. The book is 10 1/2" X 8 1/2" and runs to about 140 pages. As I am unable to get these books listed on Amazon.com, those interested in ordering a copy can contact me directly at morbidanatomy [at] gmail.com. 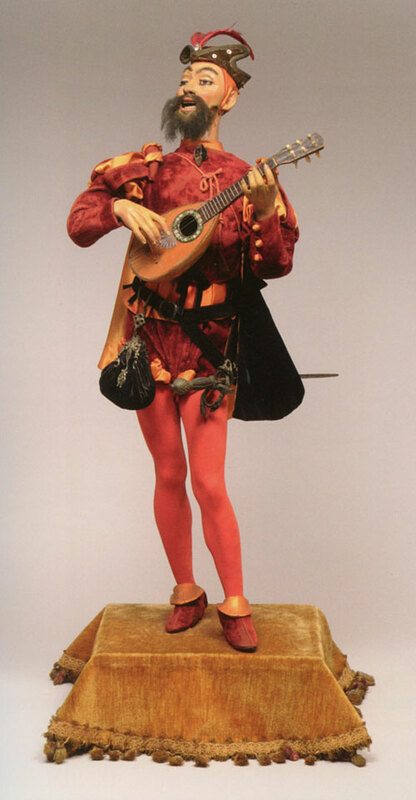 You can find out more about the Morris Museum--including how to visit the collection in person!--by clicking here. Also, stay tuned for a soon-to-be-announced second field trip to visit the collection. If interested in receiving an alert, subscribe to the Morbid Anatomy mailing list by adding your email address on the upper left-hand side of this blog under the header "Mailing List of Events, Happenings, and The Like." This Friday at Observatory! Hope to see you there. What can dead bodies tell you about the secret of life? And how can you make money from investigating these secrets? This lecture takes us back to the Dutch Golden Age when anatomists busily engaged with cutting up cadavers, orangoutans and exotic toads to study the circulation of blood, sweat and tears. 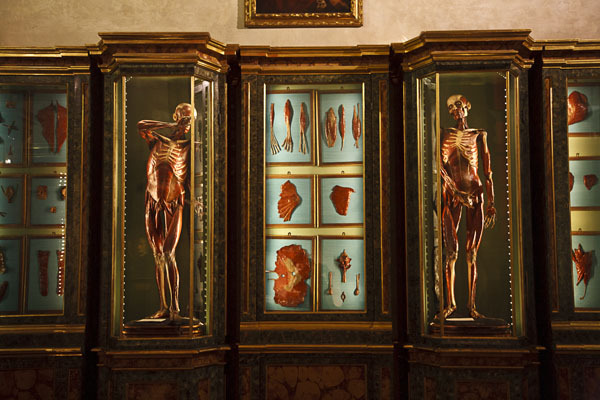 Sumptuous paintings, color prints, illustrated atlases, wax preparations and bottled embryos showcased and touted the latest discoveries about the human body. It was a good business to do anatomy. Immortalized by Rembrandt’s Anatomy Lesson, Dr. Tulp was one of the richest men in Amsterdam, and Frederik Ruysch amassed a fortune from selling his anatomical specimens to the Russian czar. 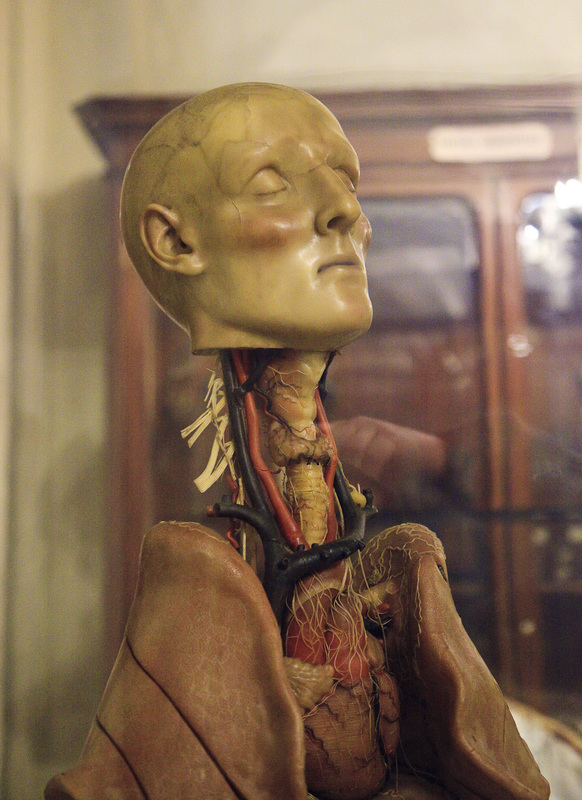 The talk reveals the entrepreneurial life of Dutch physicians, surgeons and apothecaries who transformed decaying cadavers into material wealth. Daniel Margocsy is assistant professor of early modern history at Hunter College – CUNY. He received his PhD in the history of science from Harvard University in 2009. He has published articles in the Journal of the History of Ideas, the British Journal for the History of Science and the Netherlands Yearbook of Art History, and is currently working on the book Commercial Visions: Science, Trade and Visual Culture in the Dutch Golden Age. As seen at--if I remember correctly--his shrine at Santa Maria of Campitelli church in Rome. 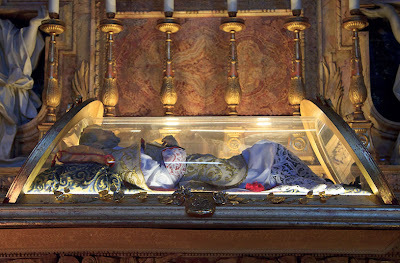 More on this saint can be found here. More from Italy to come very soon. My sincere apologies for the lack of postings and emails, and a special thanks to all of those who have so generously sent in recommendations for places to visit. 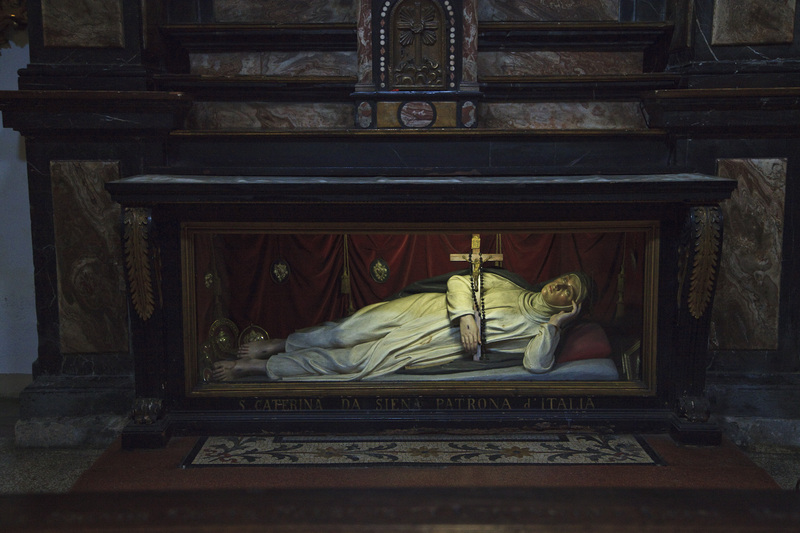 I am still on the road in Italy with only intermittent internet access and days filled to the brim with museums, churches, anatomical theatres, ossuaries and reliquaries. As a teaser, here are a few of the things Evan Michelson and I have been encountering on our trip thus far. Evan has been posting more details than I; you can find them here. I will post more--with details, I promise!-- very soon upon my return! 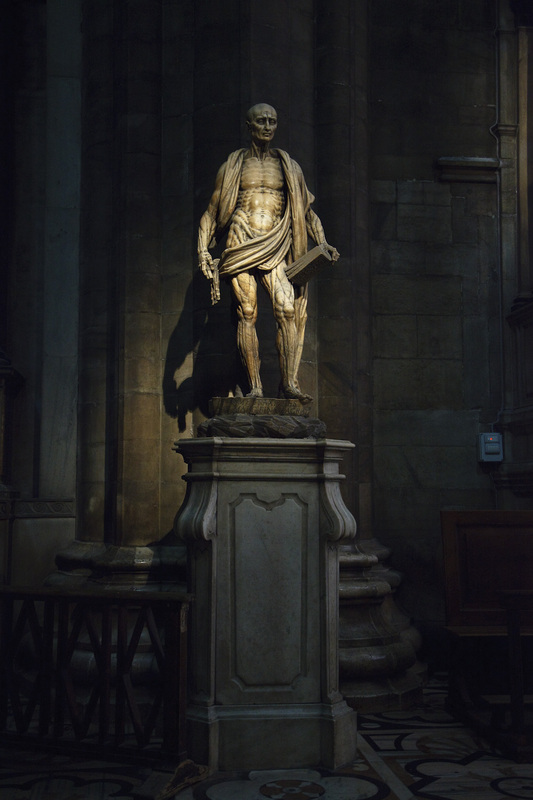 We will be exploring the social, spiritual, philosophical and material history of the human corpus from the Early Christian period, through the Enlightenment and into the Early Modern Era. 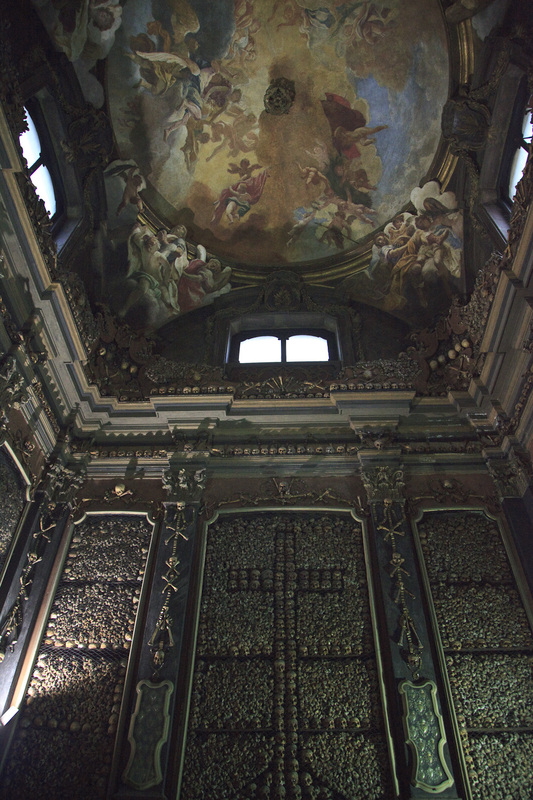 This trip will take us to medical museums, ossuaries, cathedrals and burial grounds in several different cities, and it is the culmination of a lifelong obsession on both our parts. 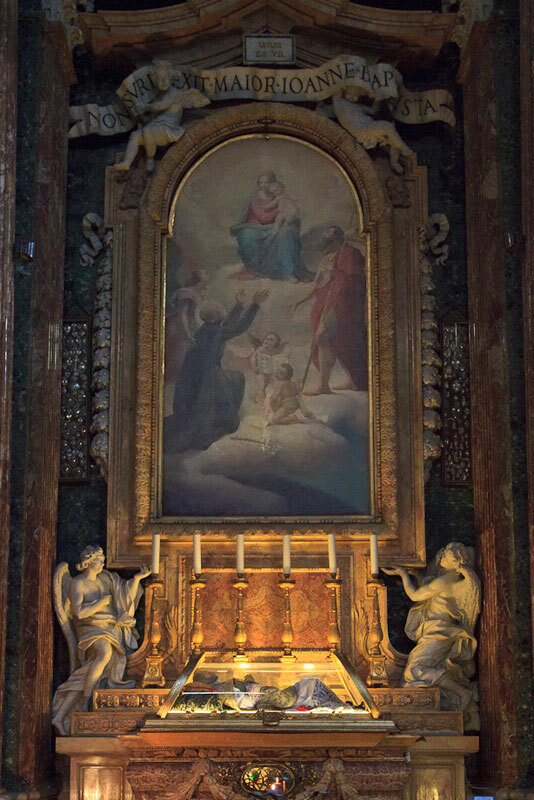 Italy seems like the logical place to start: home of the Roman Catholic Church and the greatest of the early anatomical artists, it is also the home of the Renaissance - the historical pivot point that brought us from the Dark Ages into the Age of Science. 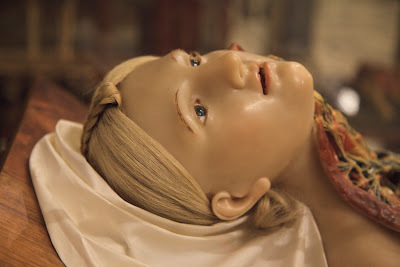 Death in all its mystery has the most profound lessons to impart, and the religious attempt to transcend decay through myth transmuted the body into an object of sensual luxury and splendor. 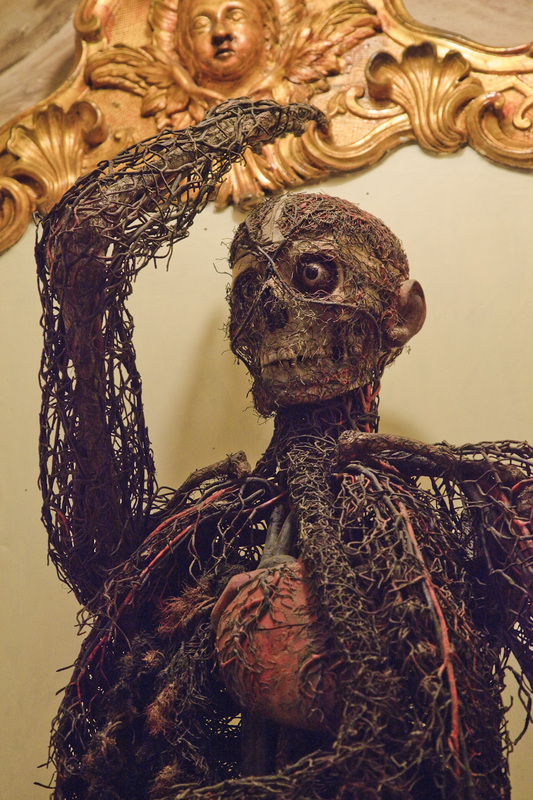 Science reclaimed the corpse, and in doing so gave rise to a different kind of purely mechanical beauty. That transitional moment is the object of our pilgrimage. So please excuse some predicted silences, and look for reports and updates here! And please, feel free to send suggestions for sites to visit, things to eat, etc. to morbidanatomy[ag]gmail.com. 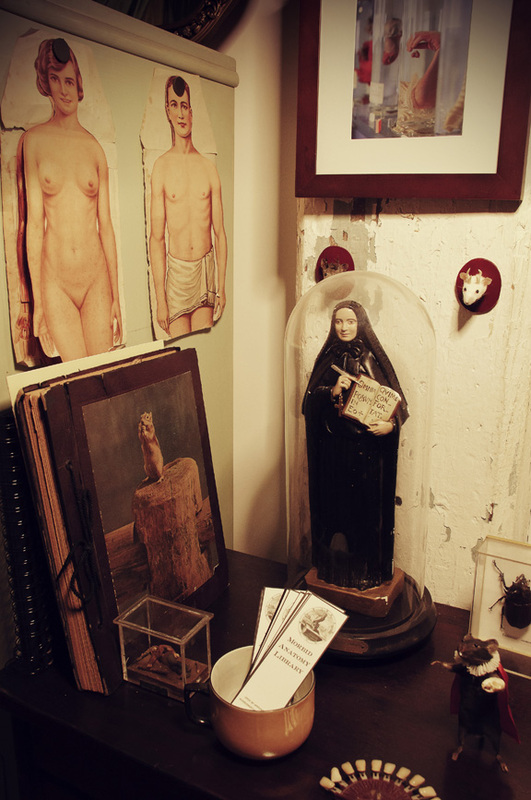 Morbid Anatomy Library Open Hours Weekends Throughout March! Special alert--thanks to 2 terrific interns, The Morbid Anatomy Library (seen above) will be open for drop-in visits weekends through the end of March; Saturday hours will be 1-6, while Sunday hours will be 12:30 to 6. So feel free to stop by and meet our charming interns, peruse the stacks, and get to know our latest addition.